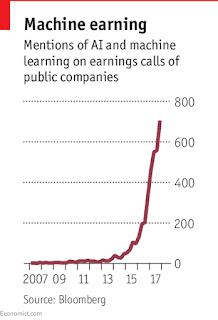 Yes, every business is now a tech business. But until recently it could be argued that not all of them realized it. AI has supplanted mobile as the latest weaponized technological application. And part of its power is that it relies on a commodity that all businesses produce almost as an ancillary by-product: data. LIE DETECTORS ARE not widely used in business, but Ping An, a Chinese insurance company, thinks it can spot dishonesty. The company lets customers apply for loans through its app. Prospective borrowers answer questions about their income and plans for repayment by video, which monitors around 50 tiny facial expressions to determine whether they are telling the truth. The program, enabled by artificial intelligence (AI), helps pinpoint customers who require further scrutiny. AI will change more than borrowers’ bank balances. Johnson & Johnson, a consumer-goods firm, and Accenture, a consultancy, use AI to sort through job applications and pick the best candidates. AI helps Caesars, a casino and hotel group, guess customers’ likely spending and offer personalised promotions to draw them in. Bloomberg, a media and financial-information firm, uses AI to scan companies’ earnings releases and automatically generate news articles. Vodafone, a mobile operator, can predict problems with its network and with users’ devices before they arise. Companies in every industry use AI to monitor cyber-security threats and other risks, such as disgruntled employees. Instead of relying on gut instinct and rough estimates, cleverer and speedier AI-powered predictions promise to make businesses much more efficient. At Leroy Merlin, a French home-improvement retailer, managers used to order new stock on Fridays, but defaulted to the same items as the week before so they could start their weekend sooner. The firm now uses algorithms to take in past sales data and other information that could affect sales, such as weather forecasts, in order to stock shelves more effectively. That has helped it reduce its inventory by 8% even as sales have risen by 2%, says Manuel Davy of Vekia, the AI startup that engineered the program. One of AI’s main effects will be a dramatic drop in the cost of making predictions, says Ajay Agrawal of the University of Toronto and co-author of a new book, “Prediction Machines”. Just as electricity made lighting much more affordable—a given level of lighting now costs around 400 times less than it did in 1800—so AI will make forecasting more affordable, reliable and widely available. Computers have been able to read text and numbers for decades, but have only recently learned to see, hear and speak. AI is an omnibus term for a “salad bowl” of different segments and disciplines, says Fei-Fei Li, director of Stanford’s AI Lab and an executive at Google’s cloud-computing unit. Subsections of AI include robotics, which is changing factories and assembly lines, and computer vision, used in applications from identifying something or someone in a photo to self-driving-car technology. Computer vision is AI’s “killer app”, says Ms Li, because it can be used in so many settings, but AI has also become more adept at recognising speech. It underlies voice assistants on phones and home speakers and allows algorithms to listen to calls and take in the speaker’s tone and content. Techtonic shiftsUntil now the main beneficiary of AI has been the technology sector. Most of today’s leading tech firms, such as Google and Amazon in the West and Alibaba and Baidu in China, would not be as big and successful without AI for product recommendations, targeted advertising and forecasting demand. Amazon, for example, uses AI widely, for tasks such as guiding robots in its warehouses and optimising packing and delivery, as well as detecting counterfeit goods and powering its speaker, Alexa. Alibaba, a Chinese rival, also makes extensive use of AI, for example in logistics; and its online-payments affiliate, Ant Financial, is experimenting with facial recognition for approving transactions. Sundar Pichai, Google’s boss, has said that AI will have a “more profound” impact than electricity or fire. 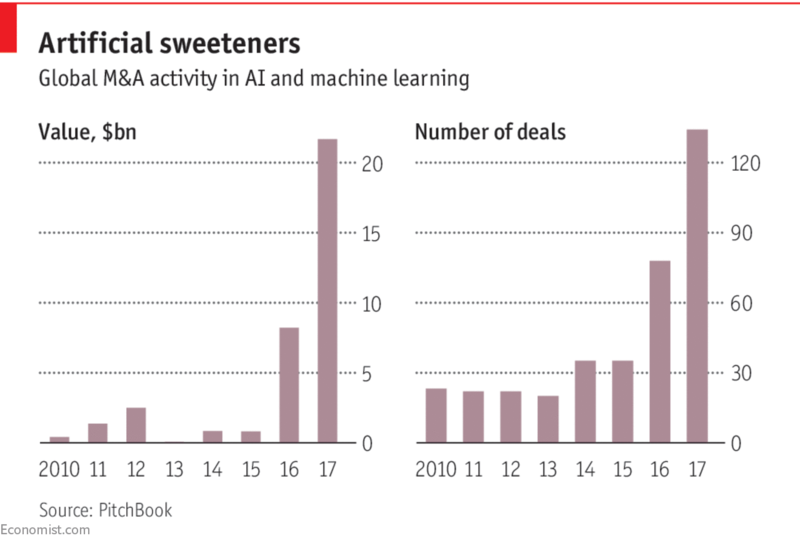 Bosses of non-tech companies in a broad range of industries are starting to worry that AI could scorch or even incinerate them, and have been buying up promising young tech firms to ensure they do not fall behind. In 2017 firms worldwide spent around $21.8bn on mergers and acquisitions related to AI, according to PitchBook, a data provider, about 26 times more than in 2015 (see chart). They are doing this partly to secure talent, which is thin on the ground. Startups without revenue are fetching prices that amount to $5m-10m per AI expert. As AI spreads beyond the tech sector, it will fuel the rise of new firms that challenge incumbents. This is already happening in the car industry, with autonomous-vehicle startups and ride-hailing firms such as Uber. But it will also change the way other companies work, transforming traditional functions such as supply-chain management, customer service and recruitment. The path ahead is exhilarating but perilous. Around 85% of companies think AI will offer a competitive advantage, but only one in 20 is “extensively” employing it today, according to a report by MIT’s Sloan Management Review and the Boston Consulting Group. Large companies and industries, such as finance, that generate a lot of data, tend to be ahead and often build their own AI-enhanced systems. But many firms will choose to work with the growing array of independent AI vendors, including cloud providers, consultants and startups. This is not just a corporate race but an international one, too, especially between America and China. Chinese firms have an early edge, not least because the government keeps a vast database of faces that can help train facial-recognition algorithms; and privacy is less of a concern than in the West. There will be plenty of opportunities to stumble. One difficult issue for companies will be timing. Roy Bahat of Bloomberg Beta, a venture-capital firm, draws a parallel between now and the first dotcom boom of the late 1990s: “Companies are flailing to figure out what to spend money on.” If they invest huge sums in AI early on, they run the risk of overcommitting themselves or paying large amounts for worthless startups, as many did in the early days of the internet. But if they wait too long, they may leave themselves open to disruption from upstarts, as well as from rivals that were quicker to harness technology. Some may have been misled by glowing media reports, believing AI to be a magic wand that can be installed as easily as a piece of Microsoft software, says Gautam Shroff of Tata Consultancy Services, an Indian firm. AI systems require thorough preparation of data, intensive monitoring of algorithms and a lot of customisation to be useful. Gurdeep Singh of Microsoft speaks of AI systems as “idiots savants”; they can easily do jobs that humans find mind-boggling, such as detecting tiny flaws in manufactured goods or quickly categorising millions of photos of faces, but have trouble with things that people find easy, such as basic reasoning. Back in 1956, when academic researchers held their first gathering to discuss AI, they were looking for a way to imbue machines with human-like “general” intelligence, including complex reasoning. But that remains a distant aspiration. The excitement around AI has made it hard to separate hype from reality. 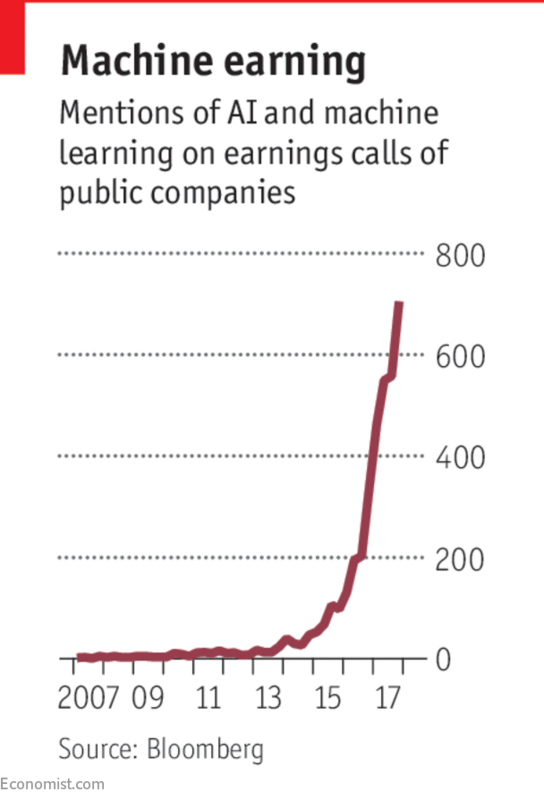 In the last quarter of 2017 public companies across the world mentioned AI and machine learning in their earnings reports more than 700 times, seven times as often as in the same period in 2015 (see chart). There are so many firms peddling AI capabilities of unproven value that someone should start “an AI fake news” channel, quips Tom Siebel, a Silicon Valley veteran. Bosses must keep several time horizons in mind. In the near future AI will reshape traditional business functions such as finance, HR and customer service, according to Michael Chui of the McKinsey Global Institute, a think-tank within a consultancy. But over time it will also disrupt whole industries, for example by powering the rise of autonomous vehicles or the discovery of entirely new drug combinations. Whereas humans may have preconceptions about which product designs or drug combinations are likely to work best, algorithms are more likely to come up with novel solutions. In private, many bosses are more interested in the potential cost and labour savings than in the broader opportunities AI might bring, says John Hagel of Deloitte, a consultancy. That is certainly not good for workers, but nor, ultimately, is it good for business. “If you just cut costs and don’t increase value for customers, you’re going to be out of the game,” he says. Some companies may not actually eliminate existing jobs but use technology to avoid creating new ones. And workers who keep their jobs are more likely to feel spied on by their employers. Some firms already use AI to comb through their workers’ communications to ensure that they are not breaking the law. Such practices will spread, raising privacy issues. A longer-term concern is the way AI creates a virtuous circle or “flywheel” effect, allowing companies that embrace it to operate more efficiently, generate more data, improve their services, attract more customers and offer lower prices. That sounds like a good thing, but it could also lead to more corporate concentration and monopoly power—as has already happened in the technology sector.